Managua, Jun 3 (Prensa Latina) Ometepe Island in Cocibolca Lake became the third Nicaraguan site in the UNESCO world network of reserves of the biosphere. The Council also included three Mexican proposals and one from Peru and added five more, one from Chile and another from Costa Rica. Ometepe, formed by two active volcanoes -the Madera and Concepcion-, is considered the largest island in the world located in a lake and "has numerous archeological pre-Columbian, petrography, statues and ceramic pieces that give proof the ancient human settlements in the locality," UNESCO declared. The surrounding lake "is an important source of sweet water," and also has many rare sub aquatic animal species such as sweet water swordfish and sharks," the declaration added. 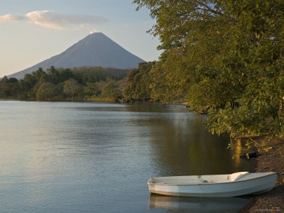 With the inclusion of Ometepe, inhabited by about 30,000 Nicaraguans, this Central American nation now has three sites that are part of the world network of reserves of the biosphere. The first, recognized in 1997 was Bosawas, the largest and unaltered tropical forest of Central America with an extension of 1.98 million acres occupying 14 percent of the national territory and has been throughout history a living space of communities of the Mayangnas and Miskitos ethnic groups. In 2003 UNESCO added the reserve of San Juan River in the southeast of Nicaragua a region that has a high amount of biodiversity of wetlands, important areas of forest development and sources of surface and subterranean water. After the decision adopted in Paris the world list of reserves of the biosphere now includes 564 sites in 109 countries.